While I like all the views, the stripes-to-chevrons in view C really sucked me in, because I have some striped knits in my stash that are becoming impatient. To get the fit nailed down, I made this one simply, without worrying with the stripe matching. I cut the front and back bodice pieces on the fold and also not on the bias. There were no finished garment measurements anywhere to be found — not on the envelope, nor the pattern tissue, nor the instructions, nor the website. Normally I wouldn’t fret… I’d just measure the flat pattern and adjust as necessary. But this bodice was in six pieces, it was my first time working with princess seams, and the waist seam was pretty curved, so I wasn’t sure how to get an accurate measurement. So, I just graded up the same amount/locations as I would normally with a Big 4 pattern. When I first put the bodice together, it was too big in the chest, which really surprised me since it seems to be designed fairly close-fitting. I took in inches — granted, I had initially added inches, but I do that with every pattern, so it’s all relative. I took out most of what I had added in the grading. But this might be a your-knit-may-vary thing. They call for medium-weight jersey with about 60% stretch, and mine was on the lighter-weight end of the spectrum. (Plus my cross-grain had more stretch than the bias did, which I thought was weird. Is that normal for a knit?) So, despite the instructions, I recommend attaching the sleeves flat before sewing up the side/underarm seams — it makes the fitting/altering a lot easier. So why does this top have a one-way ticket to donation land? Getting there. For next time with this pattern, the most significant change I need to make is to the length; I need about an inch more at center back and maybe even three inches at center front, mostly due to me skipping any FBA. I intended this as a wearable muslin, but it is not wearable, at least not on me. The overall length of the top is shorter than I like, but that’s not the deal breaker — where the waist seam hits me, that’s the problem. It falls right at the top of where I start to widen below my ribcage, so it constantly rides up farther, which accomplishes two things: flashes of bare midriff, and baggy bodice. (You can kind of see the excess fabric “stacking” above the waist seam in a couple of these pics.) So I’m constantly either tugging it down or slouching. No thank you. This is one of those specific-to-plus-size issues, I think, because that excess waist “fluff” is right were the smallest part of my waist would be if I carried less weight there. I’m trying to be as objective as possible here, hopefully it makes sense! The pattern can still be adjusted to fit me right; these are just necessary things to consider. 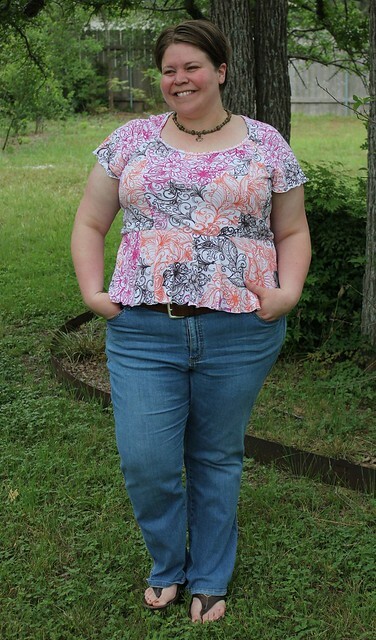 Because I knew I didn’t want to lose even a narrow-hem’s-worth of length, and I was apparently still under some delusion that I’d get wear from this make, I used a rolled hem finish on my serger for the sleeves and hem. It’s probably the best I’ve had this turn out so far; I think I’ve finally cracked the code for the right tension settings. Oh and check this neckline finish! I pinned this tutorial from Handmade by Carolyn a few months ago and have been wanting to try it. I really like it and will definitely use it again! But next time I’ll try to pay attention and put the binding seam at center back instead of center front. Whatever. Never mind. We live and learn. Gotta love the learning though, it means v2 should be a winner! Absolutely — gotta move on! Man, I hate to see you throw this one away when the fit through the chest is so nice and you like the fabric. 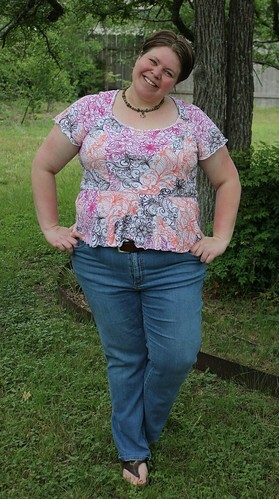 Have you thought about removing the peplum and adddng in a midriff band between the top and the peplum? You could even chop a little length off the back (tapering to nothing at the sides) to make the midriff band level. A little elastic in the midriff might also stop it from riding up so much. But if you’ve already emotionally detached from this one, then go ahead and donate. Someone is going to be very lucky finding this one. You know, I do think I *could* do something like that midriff band option, but the question is *will I*? Probably not. I might go to greater lengths to salvage it if it was the last of the fabric, but a yard is enough to do something with that I’ll wear often enough to tire of the print. ;) Actually, it does have elastic in the seam allowance of the waist seam… pattern called for it! Ok, don’t hate me, but i still think its cute and totally wearable! I get what you are saying about waist seams and fit issues (but I don’t think anyone else will notice if you are wearing it). I have the same problem a lot of the time and I do NOT have a solution. I guess I try to fit my natural waist when I’m standing, but then when I sit the waistline rides up in the front! and of course, i am sitting a lot of the time. Would this top be salvageable with a skirt? That’s what I do with my too short tops, pair them with skirts. Because its so cute and I totally think it would look great with a skirt. Maybe that cute yellow one you made a little while back? I also really like the raglan sleeve detail on this pattern. It may be added to my wish list! 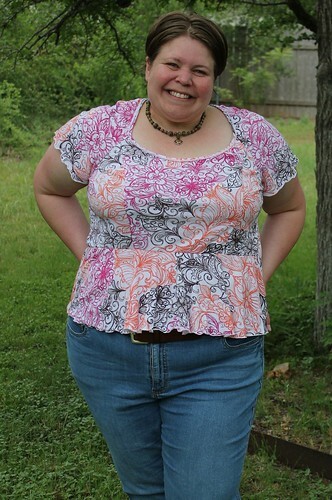 I think it is a lovely top and love that fabric. I understand about the length though, but as Megan said – try it with a skirt. i love your say cheese face, ha! Awww, thanks Dix. :) I hope you’re right!! Man, you’re so Zen about this – I’d be throwing a fit! This fabric is so cute, and I think the top is cute too. But I know how it is: if you don’t feel comfortable in it, it just won’t get worn. Better to pass it on to someone who can get some use from it. I hope you are able to make this pattern work for you – and thanks for alerting me to this pattern that I now NEED! I love that neck binding finish. I have a bunch of RTW t-shirts that are done that way, and I’ve always meant to try it but never got around to it. Will have to try harder to remember! 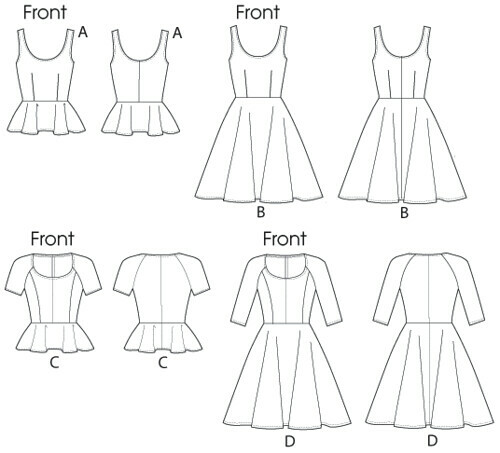 For princess seams, an FBA can be really easy. What I do is on the side piece, I’ll cut across the breast point to side and open up the triangle to the amount needed (I usually do 2 inches and I’m a 36 DDD/F) and make it a smooth curve around the triangle. Then for the middle piece, I cut across the center front piece at the same point and simply add the same amount in that area (usually around 2.5 inches to accomodate the type of curve I do. So basically, I’m just adding length to the front. I know that a lot of people do more than this, but I find for my shape, this is all it takes for me. That makes total sense, and sounds like it would have gone a long way in alleviating the issue. I’m realizing now that there’s a trend with some of my knit makes — at least, the ones that don’t allow for different bust sizes, i.e., not the Tira. :) In knits, I really don’t usually need the FBA from a width perspective; the cross-grain stretch takes care of that. BUT I’m still being affected, quite a bit actually, with the length. I need to start taking that into account at the pattern alteration stage, so that my v1s will be better. You’ve got the right idea: follow the mojo! Indeed. Hope that yard yields you something you love to wear. Me too… I was thinking this morning that I need to make something with it right away to take the sting out! i didn’t even realize this pattern was for knits! 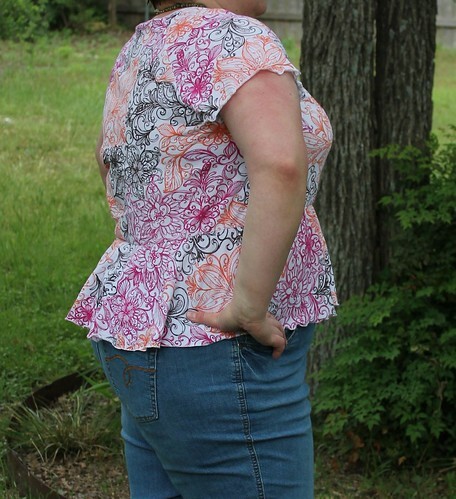 i’ll have to check it out, i’ve been having peplum envy and need to make one already. i totally get what you mean about the waist seam hitting in the wrong place, nothing is more annoying than feeling the need to tug and fidget with your clothes constantly. 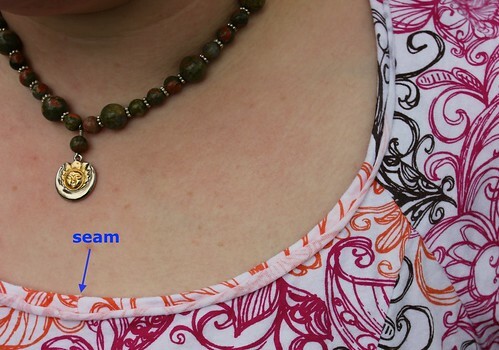 love the neckline treatment, been meaning to try that! I hate it when that happens…but V2 will be lovely. good luck with the last piece of this fabric. So weird… I totally missed this post for some reason and only saw it from your MMM post. 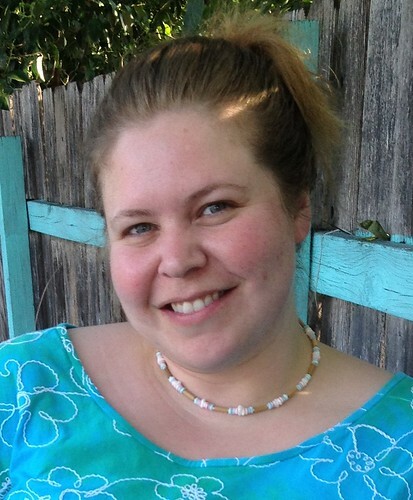 I really need to order some fabric from Girl Charlee… all your knit pieces from there are so awesome. Sorry this top did work out, but your second version will be awesome! I have this pattern traced, too, and I noticed some little weird things about it, too. We shall see how it turns out. Oooh, I’m excited to see how it turns out for you. I haven’t returned to it yet due to the great number of other things *demanding* my sewing attention ;) but I’m sure that one day I will! And totally hear you on the getting-behind thing… It’s a constant struggle! Anyway…….when I saw your comment on the McCall’s latest releases, I knew I had to post a note. I totally felt the same way. It’s crazy how we always “need” more patterns when those prices come around (Vogue tee is now on my list for next week :)) isn’t it? But this last time, I didn’t get one single McCall’s pattern. I was totally underwhelmed. Hopefully they will get their head out of their butts and give us some more good stuff in the next round. Cheers!